It is, like most of his sentences, rhythmically perfect. It has that hint of alliteration. But it is also deeply suggestive of Mosher – the man himself – and the themes that would interest him throughout his career: fathers and sons. Strong, smart women. Family. A keen sense of hope, but one balanced by a wistfulness for the losses that invariably scar the soul of the world. It’s why I dedicated my fourth novel, “Water Witches,” to Mosher. 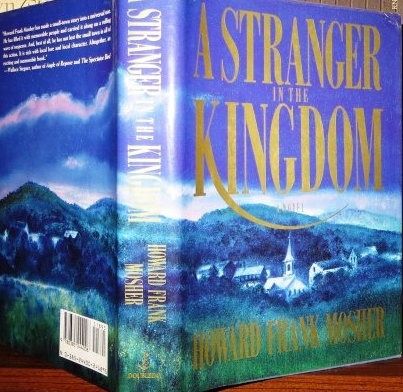 “A Stranger in the Kingdom” is both a beautiful coming-of-age novel and a brilliant exploration of race in America, as timely today as it was thirty years ago. And, of course, it is set in his mystical Kingdom County, Vermont’s Northeast Kingdom, and features that extended Kinneson family we would meet in so many of his books. But while the novel is set in Vermont, it is about so much more than our state. Think Faulkner. William Faulkner had his Yoknapatawpha County and Mosher had his Kingdom County. Mosher plumed the universalities of the human experience in the idiosyncrasies of the Green Mountains. Mosher also understood something very few writers do: writing isn’t a zero sum game. Another writer’s success in no way diminished his own. His heart was as big as his talent, and he was always generous with young writers in whom he saw potential and older writers who he believed had not received the readership their work deserved. And then, of course, there was his laugh – which brings me back to that first novel of his, “Disappearances.” (Just for the record, that wasn’t the first book he wrote. His first book is the novella and short story collection, “Where the Rivers Flow North.” Viking Publishers was excited about the story collection, but wanted to publish a novel first. Most publishers do. And so Mosher wrote one.) “Disappearances” is about a lot of things, including whiskey-running during Prohibition and one Vermont farmer’s desperate attempts to preserve his cattle herd through a beastly Green Mountain winter. But when I think of narrator Wild Bill Bonhomme’s account of his wonderful, loveable, half-mad, eternally optimistic father – Quebec Bill Bonhomme – I think first of that character’s laugh. Quebec Bill laughs a lot in the novel, even at one point with a broken jaw. Over the last two days, we in Vermont have discussed his loss as if he were ours and ours alone. But he wasn’t. He was an American treasure. He had readers around the country who revered his work. Late last week I returned from a book tour, and people in California, Tennessee, and Florida shared with me their appreciation of Mosher’s fiction. But Mosher certainly saw in all of us, his Green Mountain neighbors and friends, a window into the hope and promise that makes us all human. I will miss him. And I will take comfort in the fact that I am far from alone. Chris Bohjalian’s most recent novel, “The Sleepwalker,” was published last month. This column appeared originally in the Burlington Free Press on January 31, 2017. This entry was posted in Good Reads, The Writing Process, Vermont and tagged Howard Frank Mosher, Mosher, Vermont, writing.